"Social Reach" is an increasingly relevant term. Users turn to their networks of friends and colleagues for advice and guidance. On mobile devices, apps from Facebook, twitter, Google and LinkedIn have become the most popular way users consume their news and information. Bitmenu enables producers of premium content to reach through these networks to buyers that may be unknown to the publisher and who may be unaware of the value and significance of their contributions. Now each Offer Page can feature share buttons to the major social networks. Producers can start the ball rolling at the moment they generate a new offer. When a new Offer is created, its "Details" page provides helpful tools to get it on its way. First off, two kinds of simple links are displayed. These can be inserted with any blog, web site or email to put the premium content purchase opportunity in front of regular prospects and visitors. They also form nicely when posted to LinkedIn, twitter, Google+ and Facebook. Bitmenu's purchase and fulfillment methods make these simple links all a publisher needs to receive payment and automatically deliver premium content to buyers. But, this is just the start. The InShare button from LinkedIn packages up the offer to travel through LinkedIn and twitter networks, to targeted LinkedIn groups and also to any individual email address. Specific bloggers, reviewers and channel partners can be alerted this way immediately upon publication from within the Bitmenu interface (see illustration). 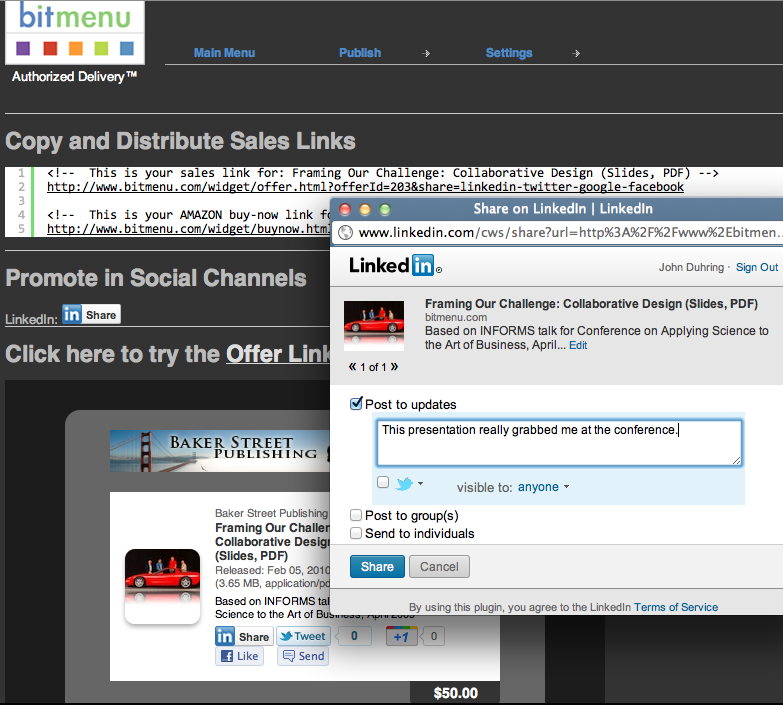 Finally, every Offer Page can display InShare, twitter, Google +1 and Facebook "Send" widgets. So, when an offer page is displayed, users have the option to not only purchase and download the item, but to notify their friends, followers and colleagues. The Bitmenu system enables anyone to direct premium content to those they know might be interested. For more information and some handy tips, see "5 Strategies for Maximizing Your Content's Social Reach". Note to existing Bitmenu publishers: To upgrade your existing links to offer pages, select Offer Management from the Publish menu and click on any offer from your list to pick up your socially-enhanced links. While you are at it, use this interface to post notifications to your friends, fans and followers for free and see where they take you.